Takes a few days to get it broken in. Works great, love the cooling gel overlay. Helps keep my head cooler. Going to have to order another. Someone keeps stealing it when I’m not looking. Stay cool and comfortable all night long with the SensorPEDIC Gel Overlay Memory Foam Pillow. Therapeutic, pressure-relieving memory foam provides lasting support for all sleep styles. The cooling gel overlay and iCOOL Technology System in this pillow help regulate body temperature while you sleep. This pillow also features a super-soft, circular-knit fabric cover that adds luxury to this cooling pillow. Dimensions 22.0 In. X 14.0 In. X 4.5 In. 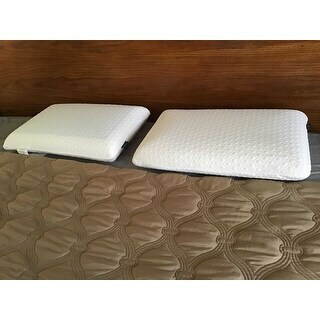 This is my second purchase of a SensorPEDIC Overlay Memory foam pillow. What I like most about both of my purchases are that they have one side that has cooling gel. After the first purchase I expressed to my husband that I liked that it wasn’t too soft or too hard and purchased a pillow for him. I bought this pillow hoping to use it for my bed. I have been having a lot of neck pain, and have been on the search for a new pillow. This one is smaller than a standard bed pillow and a little too firm for me. I put it in my desk chair where I spend at least 40 hours per week. So far it is great for comfort and lumbar support all day working. Love this pillow. My head stays cooler than ever before. I would definitely recommend this pillow to anyone who sweats as they sleep. Perfect pillow to sleep & cools the head. It is a better price then any other stores & great size, quality. My Son loved it. I wasn't sure we would like these pillows, I received them and after the second night I was very happy I purchased these. I was pleasantly surprised. I would recommend these to anyone, they do take a night or two to get used to. Very supportive pillows. It really made a difference and my whole body reaped the rewards. It was made of high quality material and I would definitely recommend. Don’t love it but don’t hate it. It’s very firm- more hard, and hugs your head so it feels a bit close on ears. The cool feel doesn’t last as much as I’d hoped but so far it’s better than others I’ve tried. A decent pillow and my neck doesn’t ache. Very pleased with pillow that I’m useing for a seat cushion in my recliner!